I feel like I am coming to the end of an era. Lara has been wearing reusable nappies ever since she was 6 weeks old. We've done so well. But, over the past month we have been struggling. The Bambino Mio nappies we use just can't cope with the volume of liquid that Lara produces! A few weeks ago we tried out the OneLife Nappy system. It was fine but I didn't get on with the shape of the nappy cover and the cotton nappies themselves struggle even more than the Bambino Mios with the current wee onslaught. I have also tried a few different approaches to using my Bambino Mio nappies. 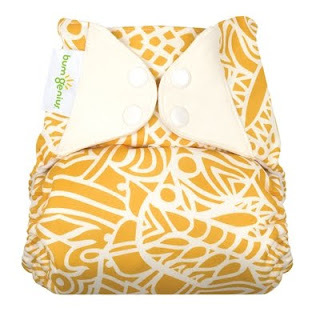 Some days I use bamboo or cotton boosters in the nappies (I had previously just reserved these for night times). This helps, but not significantly. I have also tried putting two folded cotton nappies into one of the big OneLife nappy covers. This works but it is only a solution I can use over night because the bulk of the nappy means Lara can barely walk (and no clothes fit on over the top). Lara drinks a lot. She eats a lot. But... I was never prepared for this. As soon as she does a wee the nappy is no longer usable. This weekend I think we averaged 4 changes of clothes during the day due to the fact that the nappies had leaked. The Bambino Mio outer liners are supposed to be waterproof but the liquid has started to wick through the fabric. I don't know whether this is because I have over-washed them and they've lost their waterproofing, or whether it is just that Lara's body functions have changed – I think her body has grown up. As I've told you before, Lara has already started potty training. It's a very long and slow process with us – none of this 'potty training in one week' malarkey for us! Lara does use the potty each evening, sometimes even with success, but she is a very long way off being potty trained as although she is now able to tell me when she has wet or soiled her nappy, she isn't able to tell when it will happen. So, until she is potty trained, I need to find another solution. This past fortnight we have been trying out the BumGenius all-in-one nappies (you can read the review this Sunday on Mellow Mummy). They're better, I admit, but I only have two of them so I can't use them all the time. Instead, I have rather grudgingly been sending Lara to the childminder in disposable nappies! This is partly because I don't own a bag big enough to put in enough changes of clothes for the day in case every nappy leaks (and partly because I wouldn't wish that one someone else). Using disposables every week day feels expensive to me. I find it unsightly when they sag, I hate the smell they give off and then, obviously, there's the waste they produce. On the other hand, it does mean I have less bulk to pack in Lara's bag each morning AND, it opens up a whole area of Lara's wardrobe out of which I thought she had grown. Jeans become a realistic option too! It's not all bad. I shall keep you updated on my progress on the search for a reusable nappy that can cope effectively with the situation. It would be a shame to have to give up reusable nappies now. In the meantime, if you have any wise words of advice to impart, I'd love it if you could help me.